Recently I have been having some issues with plugins while working in my lab. 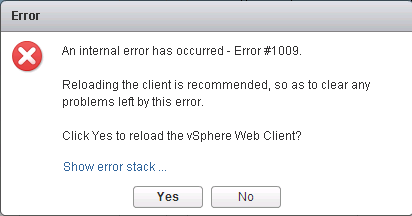 I recently wrote this article “Error 1063 vSphere Web Client” which documents how to disable selected plugins. This fixed worked for a little while, but recently I have started receving a similar error but with the Error #1009 vSphere Web Client. I tried the fix in my previous article again, however when I tried to go into the Client Plug-Ins area of the vSphere Web Client, I received the #1009 error everytime. The first thing I tried was to (obviously) Google the error, but I couldn’t find any resolution. A few people have experienced this error on the communities forum but no one had a fix for it. I phoned a friend in GSS, and they told me about an issue with cached objects that are stored in a SerenityDB folder. They aparantly have bad references and you need to clear out the cache. After running the steps below, this error has now stopped appearing and I can continue with my daily activities in the vSphere Web Client. Run these steps if you are using the VMware vCenter Server Appliance 5.5 or version 6.0 to clear the Error #1009 vSphere Web Client. Thats it. You should be fully working and no more annoying errors appearing. Pretty good information this worked for me but using the windows version of vSphere Client. I am still getting the error #1009 even after following your procedure mentioned here. I need your help. David, you’re a life saver! I’ve been putting up with the error for a while now and it’s been driving me mad. I renamed serenity folder to serenity.old just in case, and it’s been stable now through a bunch of NSX dialogs for the past hour. Can i stop the service while there are VMs running?